If nothing else, Zhenya Strigalev deserves credit for bringing together electric bassist Tim Lefebvre and drummer Eric Harland, a distinctively resourceful and forceful rhythm section that is allowed to define Never Group. Harland tautly battens down the grooves that Lefebvre propels with a gnarly throb, giving the backbone of the music a rugged tension and churn. For most of the 74 minutes, the pair flex their muscle in the open arena of a chordless trio, with Strigalev’s arid alto and often-flitting phrases the only adjunct. As if that weren’t enough of a showcase, the Russian-born, England-based Strigalev snatches seven two-to-three-minute between-song snippets from the four hours of live recording and sprinkles them throughout the disc. Referred to as “Codas,” they contain some of the rhythm section’s more heated and creative improvisations. 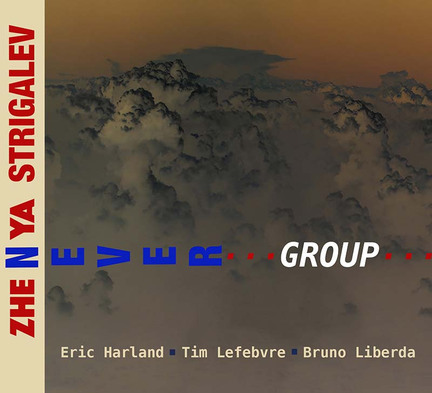 Never Group also includes four tracks electronically manipulated by Bruno Liberda, a teacher at the Vienna Conservatory. An opening skit in which a buttoned-up Englishman introduces the band serves as a talisman of Strigalev’s irreverence. There are three other guests: John Escreet delivers a majestic organ solo on “Are You Manageable?,” while the contributions of double bassist Matt Penman and trumpeter Alex Bonney (who also mixed and edited) are less definable. It results in a cut-and-paste collage of 20 tracks that hews to Strigalev’s dictum: “The whole point of what I do is that I need to surprise myself.” On Never Group, that means adding punk irreverence to a DJ’s dream-mixing of killer live drum-‘n’-bass grooves, enhanced by the spontaneity and scholarship of jazz. Even if the jumble adds up to less than the sum of its parts, the prevailing mood established by the blistering grooves of “Bio Active,” the ethereal gauze of “Bassgeingengeister” or the turbulent mischief of “Are You Manageable?” is certainly sufficient as it unfurls.